The Fellowship was fortunate enough to obtain a copy of TRUMAN VIRUS from Arcana Studios. 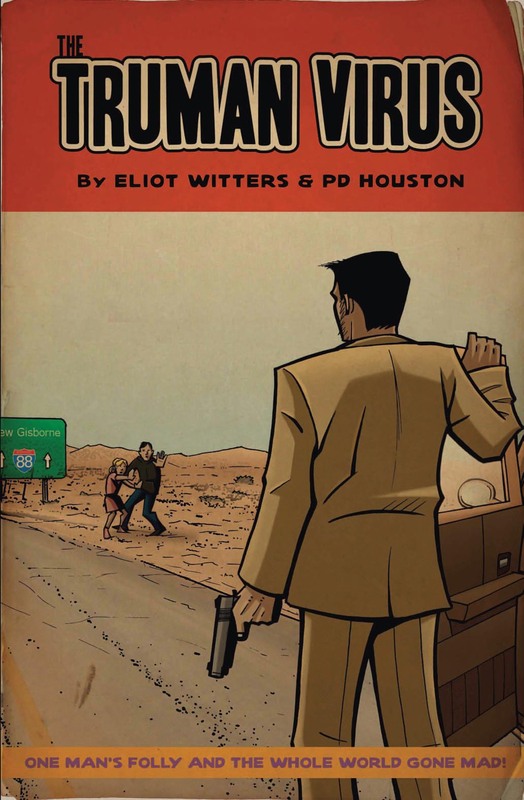 Eliot Witters wrote the story and Paul D Houston did the illustrations. Dr. Truman has discovered the cure for cancer. The problem is the side effect turns patients into zombies! However the first test subject, Zelophehead, shows no side effects due to the other formulas he’s been given. He escapes and drives the open Australian roads until he comes across young Elijah and his sick sister Isabella who are attacked by zombies. The trio takes off to find Dr. Truman hoping that his treatment will cure Isabella of her leukemia. Along the way they come across more zombies and survivors who are just as dangerous, but can they make it to the city of Nekros and find Dr. Truman in time to save Isabella? The characterizations are good, especially between the siblings Elijah and Isabella. Zelophehead’s sense of humor is great, I found myself laughing quite a few times. I want to take a moment and applaud Mr. Houston for not being graphic with the blood and violence that is standard for a zombie tale. TRUMAN VIRUS will be available in stores April 18 or at www.arcana.com.